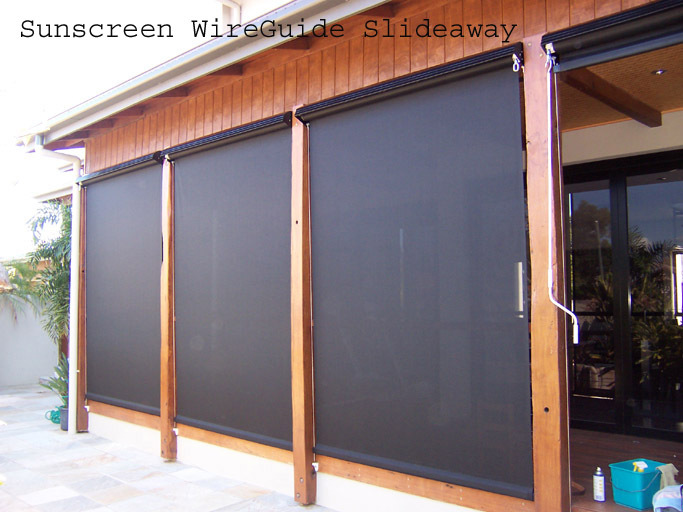 The Image Blinds Wire Guide Slideaway has been designed and patented by Image Blinds. After 23 years of manufacturing high quality blinds and awnings for the hot Queensland climate the team at Image have designed the most popular operatable external sun protection for any home or commerical development. The Wire Guide Slideaway is a tubular roll up awning operated with either a Somfy electric motor of a manual gear box. The awning skin runs vertically guided by two 316 stainless wires. The uniquly designed guide bushes at the ends of the base bar allow the awning to run smoothly in all environments with out the concern of wear on the bush or wire. The Image Blinds Wire Guide Slideaway is a very verstile awning. You may choose the best external sunscreen mesh by Mermet or a chic block out acylic fabric from Planosol to suit your decor. This awning comes with a colourbond hood as standard and can be upgraded to a “Deluxe Hood”, a fully enclosed powdercoated aluminium cassette box, for a smart clean look. The deluxe hood is also very good for extreme salt exposure as it protects the material when rolled up and the workings of the motor or gear box.